Use of Yorkshare and other technologies to support learning is an integral part of the student learning experience on a module. It is also an aspect of teaching practice that regularly changes, therefore evaluating learning, student expectations and tool choice is a continual process. This section indicates the importance of including evaluation of the role of technology within your module. Further detail on module evaluation and approaches to evaluating technology-enhanced learning is available in Section 7 of the York TEL Handbook. Considerations for evaluation will be included throughout the Handbook. Pre-course: as a diagnostic process to learn about students’ prior experience and expectations of learning technologies. During the course: reflecting on the online content and activities to make adjustments if necessary. 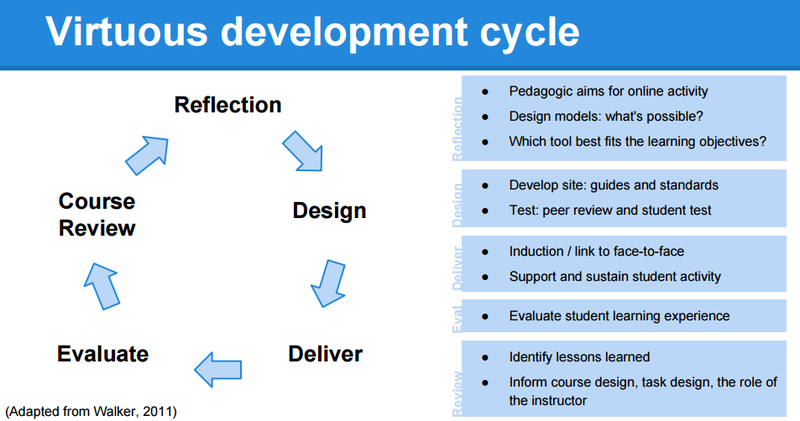 Post-course: reviewing the impact of course design and delivery methods in supporting student learning. Pre-course: compare your module materials to the baseline. You can use the Baseline Checklist [PDF] as a prompt, or ask a colleague to review your site. During the course: informally ask students in a face-to-face session whether they have been able to follow the course content online; check the access logs on the module site to see if important sections are being viewed by students. As a minimum, including questions on the end-of-module student feedback form will provide a measure of the value of Yorkshare within the module. 3 – Neither agree nor disagree. However, this approach does not offer the detail that may be required to make improvements for future practice, and questions about specific interventions are recommended. If, from any evaluation point, there emerges a need for improvements in the use of Yorkshare or other learning technologies, it is worth looking at where you can make both quick fixes and longer-term development to your practice and Yorkshare module sites. A module leader has identified that students are not undertaking preparatory reading for seminars. When the students are asked why this is the case they cite difficulty in finding the reading task. The lecturer restructures the Yorkshare module site to include a link on the left menu called ‘Seminar Reading’ and separate folders for each week, e.g. ‘Week 3 – Smith and Jones paradox’. Within each folder is a single item that includes an outline of the seminar activity and links to the PDF chapters for that week provided by the University Library. In the following face-to-face session the lecturer brings up the Yorkshare module site to show students. This demonstrates clear navigation, labelling that reflects the face-to-face teaching and context to the resources that have been provided.